As we move from the age of the machine to the age of talent, coaching has become an idea whose time has come. 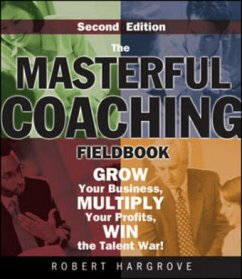 Robert Hargrove shares his secrets as a masterful coach with leaders of all levels: Coaching is about realizing an impossible dream and winning at the great game of business, not just about changing attitudes and behaviors. Impossible dreams are more possible with the Masterful Coaching Toolbox. Robert Hargrove is the founder of Masterful Coaching, Inc. He is the author of Masterful Coaching (revised edition), Master the Art of Creative Collaboration, Your Coach in a Book, and E-Leader: Reinventing Leadership in a Connected Economy. Team-Based Sales Across Boundaries. Notes. Index. The Author.